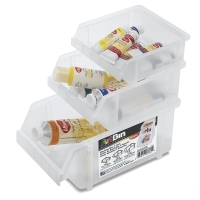 When desk or work space is at a premium, ArtBin Stacking Bins are a great way to store and organize your favorite art supplies. 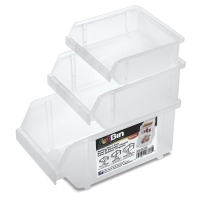 Made of sturdy translucent plastic, these bins can be stacked to make maximum use of your vertical space. The three bins, which measure 5-1/4"L × 5"W × 2"D, 6.8"L × 5"W × 3"L, and 9"L × 5"W × 4"D, can be used individually or stacked. 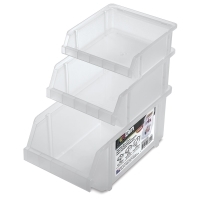 The front side of each bin is shorter than the other three sides to allow easy access to the contents.